iMCA Automation Manager creates and administers your automation scenarios. With this module, you define automation triggers and tie them to actions you want performed. The automation triggers are based on time or information from sensors, state readable switches, portals etc. Active periods by date "from – to", by weekday, combined. Test tuning mode (simulation) - execution action disabled. Plain text description of configured instruction. Smart list selection from target switches and their technology vendors, device models and element/ports, registered in the system. Seamless integration of any switch (static, momentary, PLC, etc) or Sensor (temperature, humidity, state, status, information from public services like Google Weather, etc) registered into the system in automation scenarios workflow logic. data value, range (above, between, below): temperature, humidity, power, etc. text: textual description send by connected sensor device. data sensor reached specific value, range, state sensor. text sensor produced specified textual information. Virtual connection with another sensor from the same or different devices in the same or different physical location attached as an additional condition for scenario to be executed. exact date and time or time only. sunset, sunrise or specified offset before or after sunset/sunrise. Global Enable / Disable automation scenarios. Email notification on automation task execution. Customizable email subject of notification logs for convenience and email clients rule engine processing. SMS notification on automation task execution. Sunrise / Sunset timing based on geographical location with auto observation of Daylight Savings time. 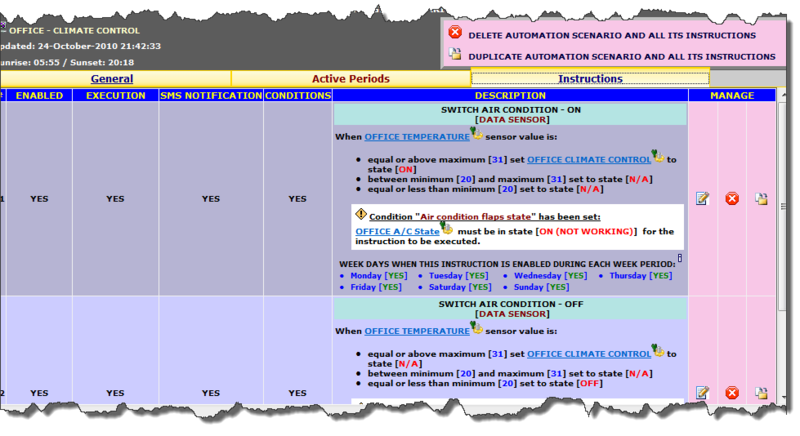 Test Automation triggers (scenarios) tool with full textual description of events that have occurred and have not. Internal automation log for past executed tasks with full textual description of events that have occurred and have not. Manual and automated log clean up.